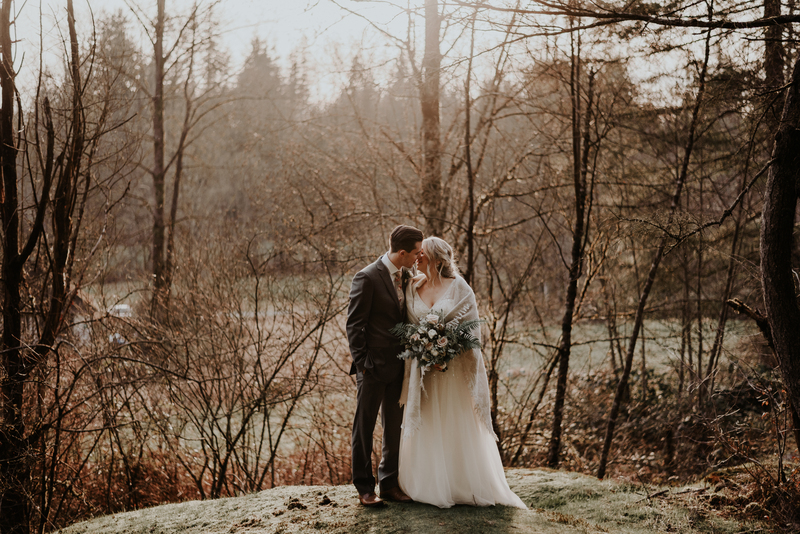 Trenton and Shelby got married on a beautiful winter day in Coquitlam, BC on February 10th, 2018. They celebrated the wonderful occasion with all their friends and family at their reception at the Poco Hunting and Fishing Club. To say the common expression that ‘Trenton and Shelby’s wedding day was filled with so much love’ would be an understatement on my part. Leading up to the wedding, both Trenton and Shelby’s family dealt with loss within the family. Once the day had arrived, the day wasn’t just a new beginning for the bride and groom, but a bonding experience for the families coming together. After a personal ceremony at the couple’s Kingdom Hall, we went to the stunning Minnekhada Park in Coquitlam for family and couples photos. Despite the cold weather, the family and friends in attendance toughed it out for the couple in order to get some amazing photos! After photos at Minnekhada Park, we arrived to their rustic reception for dinner. When speeches begun, there was a flow of emotions drifting throughout the entire room. With such a special day finally here, the family and friends of the bride and groom shared some stories, laughs and tears with the bride, groom and all those present. After the emotion filled speeches, the bride and groom had their first dance. Little did they realize a special surprise would ensue right after that moment. Once they finished their first dance and boogied with their bridal party, they were seated to watch a special surprise dance presented by the ‘Trent + Shelby Dance Crew’. The ‘Trent + Shelby Dance Crew’ was a group put together of all the children close to the Bride and Groom. The children learned a special choreographed dance as a gift for the Bride and Groom! At the end, everyone joined in to dance the night away with the Bride and Groom. Here are some of the highlights from their special day.